Day moisturizers with no SPF: is there a point? With so much focus on getting sun protection, I’m just not getting why we still see day creams or moisturizers in the market that contain no SPF. Seriously, what’s the point? I think it’s too much to get customers, especially those of us leaving in tropical climates to slather a moisturizer first, and then a sunscreen. If you ask me, I really think ALL day moisturizers should be made with some sun protection ingredients that offer at least SPF15, although I know many of you would prefer to see a higher number. This is why I don’t use a moisturizer in the day. It just doesn’t fit into my daytime skin care routine as I much prefer to use a facial oil and then a moisturizing sunscreen. Although I’ve tried to use a moisturizer first and then a sunscreen, it’s not something I like to do. In fact, back in 2008, I wrote an article about sunscreens doubling up as moisturizers and I mentioned that I don’t use a day moisturizer but just rely on my sunscreen instead. It’s been four years since and I don’t see my skin condition aggravated because of this. As many of you know, most sunscreens can get somewhat heavy and so it makes little sense to slather on a moisturizer under it. Additionally, all sunscreens contain some amount of moisturizing ingredients and using two moisturizing products may clog the pores for some of us. I don’t mind a face serum with a thinner consistency though. Like I wrote before, unless your sunscreen does not contain sufficient moisturizing contents, or your skin is extremely dry or if youâ€™re going through a winter spell, you might want to consider skipping the moisturizer especially if you feel your skin has been laden with too much stuff. Is there a point for day moisturizers with SPF? If you ask me, my answer is: they’re pretty much pointless for me. While I do have a few day moisturizers without SPF in my stash, they’re only there because they are products sent to me for review. If you read my reviews, you’ll notice that I always mention that I did not use the day moisturizer for very long. The reason they’re sent is because they’re part of a product range. And most of the time, I end up using such products on my neck instead. If the moisturizer contains some impressive ingredients, I might consider using it in the night if there isn’t a night moisturizer in the first place. So how about you? I know some of you use a facial oil like me but some of you are using a moisturizer. Are you using one with SPF? Or are you using one without? If your day moisturizer is without SPF, I assume you slather your sunscreen over? I haven’t been checking out Hada Labo’s range. If it’s moisturizing enough, it should be good then. I see. Thanks for pointing this out because it’s important. Some people may actually misconstrued that a moisturizer with SPF15 is sufficient. Personally I don’t mind a moisturizer with SPF15 if I’m indoors most of the time. The thing is now even when I’m at home in the day, I would not use a day moisturizer without SPF at all. My daily routine for day is usually facial oil and followed by moisturizing facescreen. However, my skin has been rather dry and now I added a non spf moisturizing cream before the facescreen. Seems to hydrate my skin a whole lot! I see…I did try using a moisturizer before the moisturizing facescreen for a period of time but now I just find oil and the facescreen good enough. Maybe there’s some changes to my skin because I no longer feel that it’s dry on my cheeks like it did for me at one stage. At the end of the day, you just have to know the active sun protection ingredients. I don’t totally agree with the blog entry that products other than SPF are useless…it just depends on what ingredients they use and how much they use. But I can see where the writer is coming from and I think such products can only be relied upon for casual sun protection, not when you’re exposed for swimming or outdoor sports. In any case, we don’t apply that much sunscreen anyway they way they’re being tested. This is the reason I also use a facial oil with some sun protection properties. I very much prefer to use a non-SPF moisturizer! It feels so much nicer on the skin. Plus, I like to use sunscreens of at least SPF35, all the way to SPF50. Moisturizers can’t do that. Also, to put on sunscreen properly, one needs a good big dollop of it. I only use at most a 5 cent coin big (and flat) amount of moisturizer, which is insufficient to get the SPF out of the moisturizer! In fact, I think the opposite way… I find moisturizers with SPF pointless, because most people don’t know how much sunscreen to use, and most people would just use that teeny bit of moisturizer, which is not enough to make the SPF15 effective. 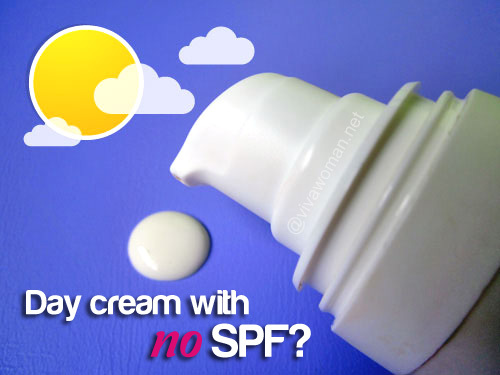 Yet, it gives them that illusion that the SPF15 in the moisturizer is enough! The thing about sunscreens is that one needs to really slap on a lot (more than how one would use moisturizer), and people forget SPF15 is just not going to work if with a thin layer. I agree that if one just rely on moisturizers with SPF, then it can be quite a problem. I am always for a sunscreen and so my idea is, we don’t need even need a separate moisturizer. But true that some people may actually think a moisturizer with SPF is sufficient and then they wouldn’t layer a sunscreen over. For me I always use face oil + sunscreen. But sometimes when I’m just at home, I might fall back on a day moisturizer with SPF. I absolutely agree. Especially here in Europe, many girls never wear sunscreen because “my foundation/day cream has SPF 8!” or “I’m wearing mineral powder!” That’s just plain stupid AND dangerous. Personally, I prefer to use a separate sunscreen over a light moisturizer/oil/gel. One reason for that is that it is extremely hard for me to find a moisturizer that works for me, same for a sunscreen. I cannot tolerate chemical UV absorbents, but most day creams like Olay use those in order to avoid that white cast physical sunblockers create and that no one would want. So yeah, since I need to apply a sunscreen anyway, I honestly don’t care for SPF in other products. Or let’s say I prefer them without. When I stay at home all day, I still need to moisturize my face, but I would want to give it a break from all the days I slather on sunscreen! I don’t bother with the SPF anymore since I layer a sunscreen on top. In fact, like Stella, I prefer mine to have no SPF since the texture is more moisturizing and hydrating without all the natural sunscreen ingredients. But since I don’t really use a day moisturizer and prefer to use facial oils, I guess it doesn’t really apply to me, haha. EcoBeauty last post is: Did V&M A Hair Story Emu Shampoo Save me from Oily Scalp and Dandruff? My routine is like yours and that’s why I don’t see the need for it too but I think Stella and Jyoan both raised very interesting points with regards with why a moisturizer without SPF is better. 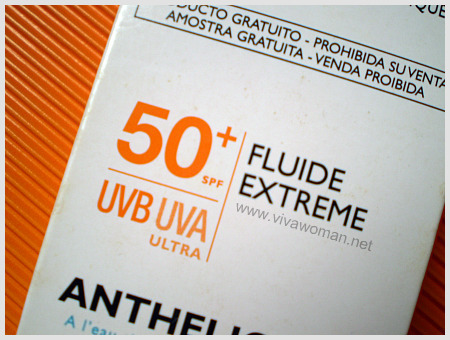 It does makes sense for people like me who’s skin is sensitive to anything that contains SPF. I now now trying out California Baby SPF30+ sunblock stick. Hopefully this will not give me rashes. Ah…thanks for the confirmation because I was wondering if those with sensitive skin might find a normal moisturizer to work better. The California Baby SPF30+ sunblock stick works ok for the 1st day but I start to have a bit of rashes around my nose area on the 2nd day. I may need to find an organic sunscreen with a lower SPF rating. Oh I see…anyway, had a quick look at the ingredient list and noticed that the product only has titanium dioxide, which means you only get partial UVA protection. Ideally, I would like a nice moisturizer without SPF followed by a light physical sunscreen on my face. However, this combo is difficult for my combination & acne prone skin. So I have changed to using a light hydrating serum, followed by a moisturiser with physical sunscreen which is less likely to cause breakouts. 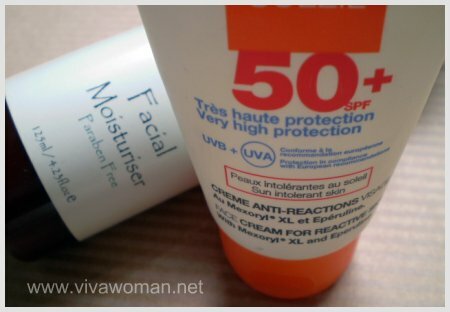 I still like the option of moisturiser without SPF because I am very sensitive to a lot of chemical sunscreens. So I rather do without sunscreen at times (when I am totally indoors) than suffer from irritation & breakouts. The lesser of the 2 evils! I see…it’s interesting and enlightening to find out how others use their products because of different skin conditions. I on the other hand must always a product with some sun protection even when I’m just at home in the day. sesame, you rocks!!!! I am really very like your blog and recommend to my friends too. Its really knowledgable and helpful. i really tried harder to find the same kind of indian blog but couldn’t as i found online shopping a bit hazrdous a prefer to shop on spot . No blog describes the products with its pros n cons like you with detailed discription of contents. LOVE YOUR BLOG !!!!!!!!!!! Yes…Like Divya said ur blog is really unique..I always apply my day moisturizer once coming back from office after cleansing my face..just for hydration purpose…but seldom used in Daytime while going out. So is it still day or already evening when you return from work? Cos this routine happens for me too. Sometimes I come back early like 2 or 3pm but because the sun is still up, I must use a moisturizer with SPF even when I’m not stepping out. Yes Sesame, it will be after 6 pm i used to apply this day time moisturizer. Haha…I know what you mean. And I only started with sunscreen in my mid 30s. I am all for lesser products. I am now using a moisturizer with no SPF + a BB cream with SPF 50+++ and foundie with SPF too. I figured since I am in the office most of the time, my sun protection is sufficient.. Thoughts? MsGlitzy last post is: New Lifestyle Stores in Singapore: Francfranc and G.O.D. I think the combination you’re using is okay for casual sun exposure given you’re indoors most of the time. However, it also depends if your BB cream comes with broad spectrum protection against UVA and UVB (got to check ingredient list). If it’s just UVB, then it’s not sufficient. SPF from foundie is not sufficient but since you’re not using it alone to get protection, then it’s not that much an issue. I suspect it has a combination of physical and chemical sunscreen protection ingredients…in that case, you’re good with it. My daily facial routine starts with Olay facial cleanser, Golden Caviar toner and emulsion by Skin food and followed by a BB cream with SPF by skin food. I can’t leave the house with SPF on. So you basically rely on the BB cream for protection? I use SPF 30 BB cream, I don’t basically use sunblock daily. It depends on the weather, because I feel wrap up with it. Sometimes I allow my skin to take a break from a lot of application. True…it’ll be good to keep our skincare routines simple. 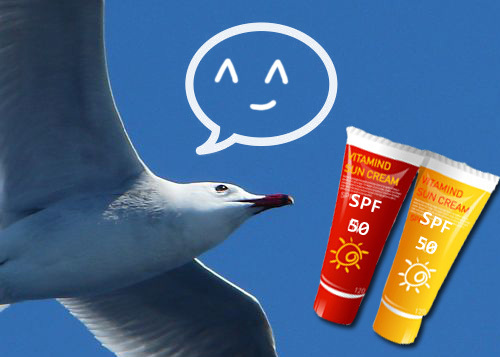 Our weather is terribly hot here and the UV index is very high and so I feel really uneasy without a daily sunscreen. I have fair, combination skin (slightly oily in the T-zone with congested pores/slightly dry in the cheeks) and I live in a Mediterranean country with lots of sun almost all year round, but my routine changes depending on the products I use. My current routine, which I find quite convenient, is a light moisturizing serum (Derma E DMAE Alpha Lipoic C-Ester Serum) + SPF 50 sunscreen (La Roche Posay Anthelios Fluide SPF50+) in the morning and Grapeseed Oil (face) + some anti-wrinkle cream for neck/decollete. In general I try to moisturize+protect in the mornings and nourish/de-congest/anti-age in the evenings. So far so good! Sunscreen would not have been moisturizing enough for my cheeks, and the combination is light enough for my T-zone, so I can have both without much fuss or high cost! Actually, what I would very much like to see is more eye creams with some SPF protection. I wear sunglasses when outdoors, and I kind of “tap” some of my sunscreen on the outer part of the eye area, but proper eye sun protection would work better IMO. If it’s sunscreen alone, it may not be completely moisturizing cos some of the ingredients can be drying. I seem to recall La Roche Posay Anthelios Fluide containing alcohol but I could be wrong or they may have changed their formulation. I agree with you w.r.t eye creams with SPF protection. I hardly see them. I slap quite a bit of sunscreen as I use moisturiser without SPF daily. My face considered oily so I need some moisture on my skin. I have not found a suitable moisturiser with SPF in it. So, never tried that alone. I understand that if I put too little, it does not work well. However, we should note the protection of UVA (age damage) and UVB (Sun burn)that may not be labeled on some over the counter products. As consumers need to do research on the ingredients before slapping on our skin, especially our face. That’s when BB Creams come in for me! Especially the ones with higher SPF like 30 and above. One sunscreen that I can recommend with moisturizing function is Laneige Triple sun block or something. The name is quite long. Anyways, it has SPF40 but PA++ only, with moisturizing and color-correcting functions. 2 weeks ago,it was summer here, cos now it looks like autumn here with rain and clouds. And I was only using the Laneige sunblock and set with loose powder. No need for addiotnal moisturizer. But my skin is combination with oily T-zone. Cheeks are normal, for now. It could be dry at times. And at other times,it’s usually BB Cream for me. Takes care of almost everything. But I do put a thin layer of hydrating serum (currently using Neogence) and the Neogence Oil-Control gel-cream (for oiliness on my T-Zone) sometimes. Complicated I know, but my skincare regime is not fixed. Ah…another one who relies on BB cream. I think if the BB cream is agreeable to your skin then it’s good enough cos it does a few things all at once. And I know what you mean by not having a fixed regime…I do switch around a bit sometimes but more for my nightime routine. I actually prefer daily moisturizer to not have spf because I will add sunscreen over it anyway! Plus my sunscreen is very dry and powdery (love it). Not even close to moisturizing my skin. Plus I like no spf day moisturizers because then I can use it at night. Without the fear of the spf ingredients clogging. Ah, doubling up the day moisturizer for night…interesting! I do that sometimes too. Yes, there is a point to NOT use sunscreen. To avoid putting unnecssary substances on the skin. I only use sunscreen when I sunbathe or if my skin is exposed to the sun for a longer period of time (in the mountains or in summer I wear a hat and put sunscreen on the areas that are exposed, for example the arms). Otherwise my organic creams and foundations contain oils that offer enough basic protection against harmful rays. I see…I guess where we are located also differentiate our needs. Like you, I would love to be able to just rely on my oils but I live in Singapore and the weather here is like all year summer except for the year end and we do need sunscreen for most part of the time. Sales of sunscreens are good here…haha. I went to an esthetician and got Glymed Plus Photo-Age Protection Cream 30+ for the daytime and Vitamin E Sensual Cell Cream for night. I agree that SPF is very important for the every-day. Why not use the non-SPF creams at night? Yeah, that’s a good idea. I’ve started using one for the day in the night because it has very good ingredients. I work in skincare and the reason moisturisers don’t have an spf is the whole point of your moisturiser is to penetrate into your skin to the lower layers, there shouldn’t be much if any product left on the surface, especially not the amount you should have as spf! That’s why so much makeup contains an spf as that is designed to stay on the surface of the skin. Ideally everyone should finish their skincare routine with an appropriate moisturiser to suit their skin type and any concerns they have, follow that with an spf specific product and make up if they choose to. Any decent, good quality moisturiser would contain very little or no spf at all, otherwise it’s defeating the purpose of what your moisturiser is meant to do! Thanks, Sarah, for sharing your POV. I agree with what you say but I suppose using a sunscreen that is moisturizing is good as well. I actually prefer using a serum when it comes to enjoying skin care benefits. I’m sensitive to sunscreen. It makes my eyes water and sinuses get irritated. So yes there is a point to having day creams without a SPF.